A 63-year-old female presented to our hospital with right hypochondrium pain. She underwent appendectomy at the age of 20 years and had an uneventful recovery following that. Laboratory results showed AST of 34 U/L; ALT of 32 U/L; and ɣ-GTP of 142 U/L. 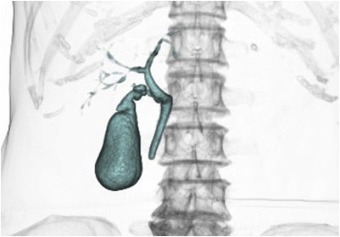 A gallstone was found on computed tomography (CT) and abdominal ultrasonography. By drip-infusion cholangiography with computed tomography (DIC-CT) performed before LC, we were able to clearly visualize the cystic duct, common hepatic duct, right anterior sectional duct, and right posterior sectional duct, but the subvesical bile ducts were not visualized. She was scheduled to undergo LC for symptomatic cholelithiasis. One milliliter (2.5 mg/ml) of ICG was injected intravenously prior to beginning the surgery. 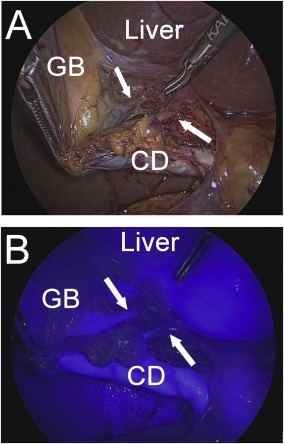 The D-light P system &#40;KARL STORZ, Germany&#41; with the integrated indocyanine green fluorescence imaging (IGFI) mode was prepared to visualize the bile duct. The operative field was inspected in the IGFI mode before dissection of Calot’s triangle. The common bile duct and cystic duct were visualized on FC. LC was performed using a standard procedure under normal lighting. During dissection, FC was used when needed until the critical view of safety was confirmed. 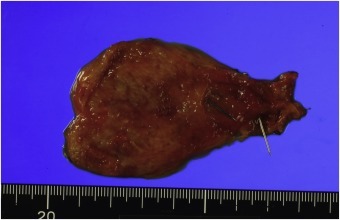 FC detected two aberrant bile ducts, 1 to 2 mm in diameter, during the dissection of Calot’s triangle. We achieved the critical view of safety, and considered these ducts to be the subvesical bile ducts. After division of the cystic duct and cystic artery, we ligated the subvesical bile ducts with clips and divided them. Then, FC was used again to evaluate bile leakage. Dissection of the gallbladder from the liver bed was continued and the gallbladder was resected. The resected specimen revealed that two subvesical bile ducts drained into the gallbladder. Postoperative laboratory test results were all within normal limits. CT demonstrated no dilatation of the intrahepatic bile duct after LC. The patient was discharged uneventfully on the fourth postoperative day.